The Bat is a popular email client that allows to work with unlimited number of the mailboxes, has powerful sorting filters, fully customizable message templates, Mail Dispatcher and many more other features. The main task of the program is to secure protection of the correspondence from data theft and monitoring by third parties. The program ensures the privacy of correspondence, protecting confidential data as it can work without using the services of the global e-mail providers and Web interface. The Bat is able to handle an unlimited number of e-mail accounts and to process and store an unlimited number of messages. The program offers a system of automatic message filtering, easy system of templates, message editor with the spell checker and many other useful features. 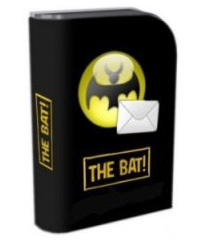 The Bat protects your e-mail data from accidental loss providing the possibility to make backups of all the configuration settings, address books and folders with messages, and to restore them. The Bat! prevents the intentional data distortion and loss of confidential data while transmitting messages via the Internet. Safe authentication CRAM-MD5 does not allow unauthorized users to access your e-mail account on the mail server. The Bat! protects your information using different methods, including the encryption of the message base on the hard drive and e-mail traffic encryption.